English - Stichting "Lang leve het Zambiaanse kind"
The “Long live the Zambian child” Foundation (in Dutch : Stichting “Lang leve het Zambiaanse kind”) has been formed with the objective to collect funds to support projects for the improvement of living conditions of children in Zambia. 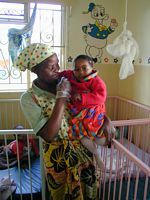 In 2004 the foundation started with the support of the “Transit home of the Childcare and Adoption Society” in Ndola (Zambia). This is a small orphanage that looks after children of 0-5 years old, orphans or otherwise vulnerable children, during the search for a structural solution. Sometimes the child can go back to relatives who can take care off the child, in other cases a foster-parent can be found. 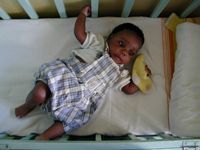 Also adoption is a possibility for Zambian as well as for foreign adoption parents. The support of this orphanage ended in 2017. In 2008 the foundation also started to support Antonella’s Transithome in Chinsali. This is a small transithome which is being runned by the Chinsali community supported by the “Association of Lay Missionaries” in Chinsali. Also two scholar projects in Isoka and Kabwe are being supported. The foundation, situated in the Netherlands, has been initiated by Marleen Kramer and Hans Konig (who adopted two children from the orphanage in Ndola during the period they were working in Zambia) after a visit to the transit home in 2003. During that visit the financial situation was alarming, because sponsors had stopped their support. That time there were only 12 children in the orphanage, while the capacity of the home is 30 children. The reason was lack of funds. This in a time that the number of children in Zambia that needs help is increasing due to aids and poverty. For that reason action was needed and in 2004 the “Long live the Zambian child” Foundation was formed by seven enthusiastic boardmembers. The goal of the foundation is to establish a structural financial contribution to the operational costs of the supported orphanages. By doing that a save shelter for the children can be established for a longer period. Besides this the Foundation also intends to support other local initiatives to improve the situation of the children in Zambia through the many local contacts. For example since 2008 the foundation also supports school projects in Isoka and Kabwe. The foundation has been registered in the Dutch Trade Register of the Chamber of Commerce under number 09141565. Because the foundation has no overhead costs (with thanks to our sponsors), donations can totally be used to improve the local situation in Zambia. You can support our work by donating on a special bank account of the foundation.